Home »Uncategorized»Selling at a “loss”. Might not be as bad as you think! I get it. Selling your investment property for less than you paid for it my seem like a real kick in the backside. After all, who likes to “lose” money. Let’s see why selling for less than you paid might not be a bad thing. What’s the value of your time and mental health? Regardless of reasons how we came into possession of it, we now have property that isn’t our primary residence. And it takes a lot of work, a lot of time, and it can cause a lot of stress. I know what you’re going through. Years back, I owned property in a Southern Illinois town about 90 miles from Granite City. The time it took for me to “manage” that property was expensive. I was paying two mortgages, paying property tax, paying to keep the electricity on, and paying a water and sewer bill. I also had to run to the property multiple times to maintain it. You can’t just leave a property vacant for any length of time, especially when you’re trying to sell it. Remember that property I was selling in Southern Illinois? I ended up selling it for less than I paid for it. I held onto it for about eight months before it sold. Man, did that really cost me. I was paying for utilities for eight months! I was paying insurance for eight months! I was paying someone to mow it for eight months! I was paying taxes for eight months! I estimate those eight months probably cost me over $4,000.The only upside to the travel was being able to see my friend Bradford, who owns a landscaping company in DuQuoin, IL. Check him out on Facebook if you’re in the Franklin, Perry, or Jackson County area. As I look back on this experience, I quickly realize it would have been much better to rip off that bandage right at the beginning. Had I lowered the initial asking price by $4,000 I would have sold this thing much faster. I’d have been out no less money than I ended up spending and I would have had all of that time back that I spent running back and forth 180 miles round-trip. And that’s where Selling Your Time comes into play. 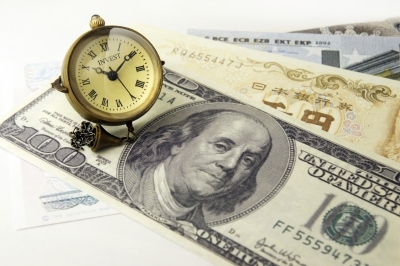 Is selling your time more valuable than money? A funny thing happened to me on the way to the soccer fields this year. I became a coach. My boy can be seen in this photo along with some of the other eleven kids on the team. If you know me personally, you’ll already understand that my knowledge of soccer is quite limited. I know what a soccer ball looks like, I generally know how the game is played, and I can tell you that a red card is not a good thing. But that’s the extent of my knowledge. My kid needed me to coach or he wouldn’t have a team. So I stepped up to be the coach. I wouldn’t trade that time for the world. It probably took me two or three extra hours a week. I was paid $0.00/hr to be coach. In fact, buying equipment and treats for the kids actually cost real $$$. Since I own rental properties, I get calls during meal time. I’ve received calls at midnight, gotten calls before sunrise, and missed bath time. But this was the life I chose. Did you? Asked differently, is this the life you want right now? Some day, I’ll probably get out of the investing game. When the time it takes interferes with the life I want, and with how I spend my time, I’ll move on. You cannot put a price of your personal time. So let’s say you end up selling your property for $5,000 less than you paid for it. Is $5,000 worth the time you’ll gain back? Will that $5,000 less mean anything to you really? I mean, think about it for just a second. Unless you’re going to have to bring money to the closing table to pay off the mortgage or back taxes, you’ll be at least even with where you are now! And you’ll get your personal time back. So if your time is worth anything to you, are you really selling at a loss? Only you can answer that question. If you’ve read any of my other posts, you know I love examples. So let’s use one now, shall we? Our example property is a duplex you purchased twenty years ago in South Roxana, IL for $75,000. You needed $5,000 of repairs in the first year and you have some large capital expenses in years 4, 10, and 14. You decide to sell it in year 20 and the best I could offer you was $65,000. 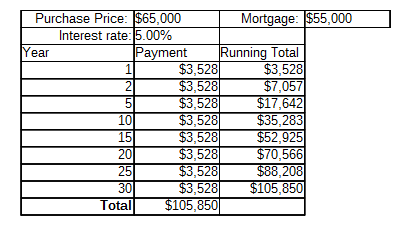 I’ll keep it simple by leaving out things like closing costs and such in the example. So how did you do on this investment even though you are selling it for less than you paid for it? Let’s find out? Did you end up selling at a loss? If you review the whole life of this investment, you really did quite well for yourself. You didn’t end up selling at a loss. You ended up making over $4,700 a year on this investment. You know what’s shown on the example above? You only have $15,000 into this deal. Yet you made $4,700 a year on it. That’s a 31.74% return on your original investment! Let me ask you something? Have you ever had a stock broker tell you “Hey, even if we sell at a loss you’ll end up making an annual return of 31.74% on your investment?” So go ahead and take that “loss” all the way to the bank! Want to know how to make even more money on this “loss”? Go back to my post on selling with owner financing. Let’s continue on with our example. 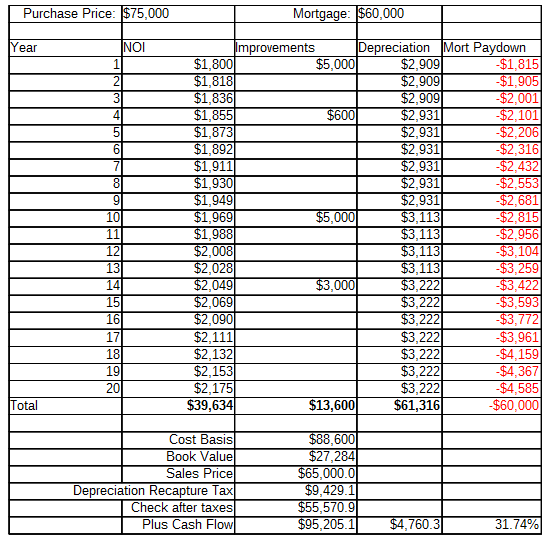 Only instead of taking the $55,571 check at closing, you finance $55,000 of the $65,000 sales price. We’ve worked it out so you won’t have to come out of pocket for your depreciation recapture taxes so you’ll walk away from the closing table with a check for $10,000. The terms for the note you hold is a 30 year loan at 5%. That’s a lot more than you could make with any CD product out there and you know the note is safe because you know the property! How did we do? Well, by selling the property to me using owner financing, you’re getting a yearly payment of $3,528. That’s more money than you were making while running it as a rental. And you ended up receiving over $100,000 for the property while not having to take one phone call about a leaking toilet, didn’t have to worry about turnovers or leasing problems, and you didn’t have to deal with evictions. If something were to happen to you, your heirs would continue receiving a check in the mail every month as part of your financial legacy. And they wouldn’t have to know a thing about the rental business. I don’t know about you, but I think your loss was really a big gain. So there you have it. Selling me your property at a “loss” ended up making you anywhere from $55,000 to over $100,000. Plus, you have all of your free time back. What do you think? Do you have any examples where selling at a “loss” actually turned out to be a big gain? Any questions on this topic or any other real estate investing topic? Let me know below. I’d love to receive some comments.